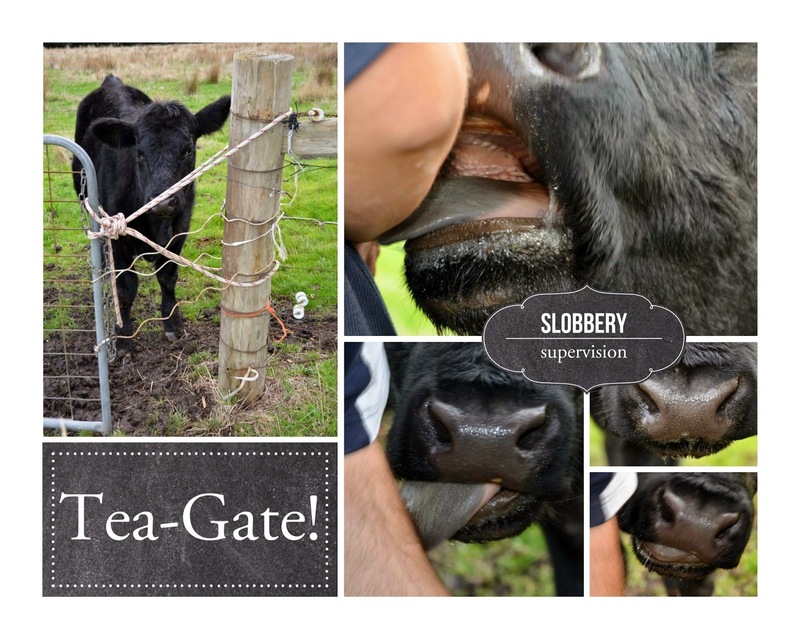 Hamby Home(in)stead ...: Tea Gate! We were chatting with our landlady today, talking of fences and how wonderfully Tea is behaving now that she's learned to respect the electric fence. (She's stayed in her paddock for nearly four weeks - a record)! As we stood looking over at Tea, Nick commented that the only weak link of the large paddock is the gate. It wasn't long after that conversation that I looked out the window and spotted our cow on her knees, attempting to wriggle through the gap between the gate and fencepost! She was so determined that the fencepost was moving and looked as if it were being lifted out of the ground. I ran from the house to shout sternly at Tea. She retreated quickly, looking very guilty! Nick grabbed some pliers and effected a modification to the gate, running a strand of electric fencing tape along the opening. As you can see, his efforts were closely supervised by our would-be escapee. The large bow in the gate isn't Tea's doing. 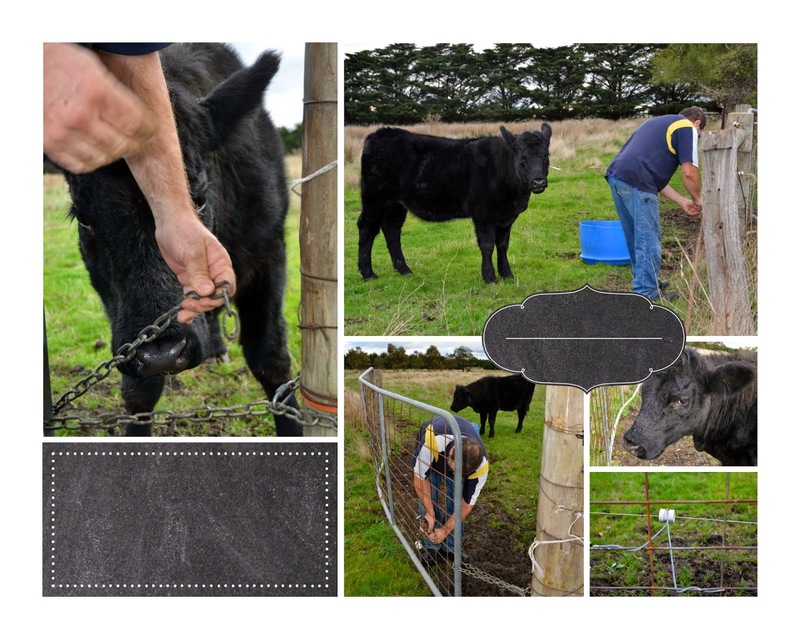 One of the visiting bulls enjoyed rubbing against the mesh - and the gate wasn't up to his one-tonne attention! Tea pushes on the gate too but isn't anywhere near as heavy as him - yet! I'm not sure how much Tea weighs but I did measure her while Nick was fixing the gate. Last June she measured 75cm to the top of her shoulder and now she is 118cm. That's an increase of 43cm in just one year! I measured Vaughan last night and in the same period he has grown 4cm, so is currently 138cm tall - which gives him a little clearance over Tea. (It seems I also measured Tea in August last year. She was 90cm then, a height increase of 15cm in 11 weeks. Not quite ten months down the track, she's achieved another 28cm).